If you are tired of your removable dentures slipping and sliding around in your mouth and causing you embarrassment, getting snap on dentures in Costa Rica could be the easy and affordable solution you have been looking for. Dental clinics in Costa Rica can quickly and easily fit you with this comfortable dental prosthetic, giving you a great excuse for a vacation. According to the American Dental Association (ADA), up to 69% of adults in the United States suffer from edentulism—the lack of one or more teeth. With dental insurance out of reach of so many Americans, snap on partial dentures in Costa Rica could be the best way to deal with skyrocketing dentist fees. Snap on dentures are a more secure alternative to traditional removable dentures. The dentist will insert two quick and easy implants in your jaw, and the dentures snap securely into place and don’t move! If you come to Costa Rica for overdentures on implants, you will return home with a brand new smile to show off. 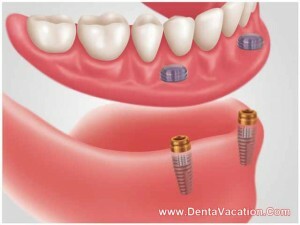 Why Get Snap On Dentures in Costa Rica? Although many people travel to this lush Central American country for its pristine beaches and vertiginous cloud forests, more and more are coming to Costa Rica for dental tourism. Snap on smiles and other cutting edge dental procedures keep dental tourists coming to Costa Rica. How much do snap on dentures cost in Costa Rica? The answer to this question could surprise you. Many Americans and Europeans return home boasting of savings from 30 to 70% on dentures, crowns, and porcelain teeth veneers in Costa Rica. However, the cost of a snap on smile in Costa Rica isn’t the only advantage to seeking dental care in Central America. You value your time just as much as your money and dental clinics in Costa Rica help you save big. Our network clinics in Costa Rica boast of in-house laboratories for the timely fabrication of implants and other prostheses. No more weeks of waiting for your dental prosthesis. The Council for the International Promotion of Costa Rica Medicine (PROMED) reports that 80% of Costa Rican dentists have been educated in the United States or England. With such a high prevalence of expert dentists, you shouldn’t have any problems finding the right one for you. Choosing Costa Rica for snap on dentures is an easy travel decision for those living in the United States or Canada, since it is much closer than other dental tourism hot spots, like Turkey or India. Do your research—there is a plethora of dentists and clinics to choose from. Make sure you find the right one for you. 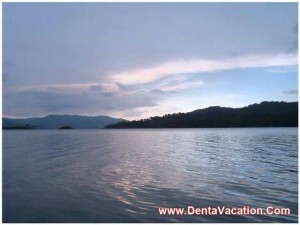 DentaVacation works with trusted and experienced dentists, and can help you in your search. You will need a valid passport to go to Costa Rica for snap dentures. If you do not have one, make sure to apply for one with ample time. As of the writing of this article, wait times for the routine passport service ranged from 4 to 6 weeks. Be aware of your surroundings when out and about in Costa Rica. Don’t go down any streets that resemble streets you would avoid back home. Also, try not to wear flashy clothes or jewelry, so as not to make yourself look like an easy target for thieves and swindlers. Do not buy, use, or possess illegal drugs in Costa Rica. Plan a wonderful vacation. Costa Rica is a tropical paradise —you may go see the Pacific Ocean, then cross dizzying mountains to take a dip in the Caribbean Sea. So if you need a new smile, but can’t afford one at home, why not spend less and have fun doing it? Come to Costa Rica for snap on dentures, get a tan, then go back home and show off your dazzling new smile. When they ask you what has changed, tell them you got a smile makeover in Costa Rica! Fill out the estimate request form on the right to receive more information about snap on dentures in Costa Rica.